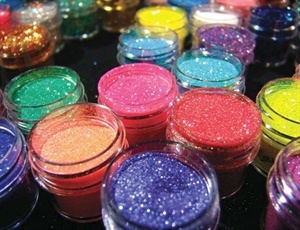 A current trend is to add glitter, mylar, and other embellishments to nail enhancements, including pigments, glitters, mylars, clays, etc. Beautiful, custom nail art can be created by embellishing one's powders or gels. Embellishments sometimes also is a term for not necessarily integrating product into the acrylic or gel, but encasing it, thereby not altering the product's performance at all.